More interesting marking options would have been nice. 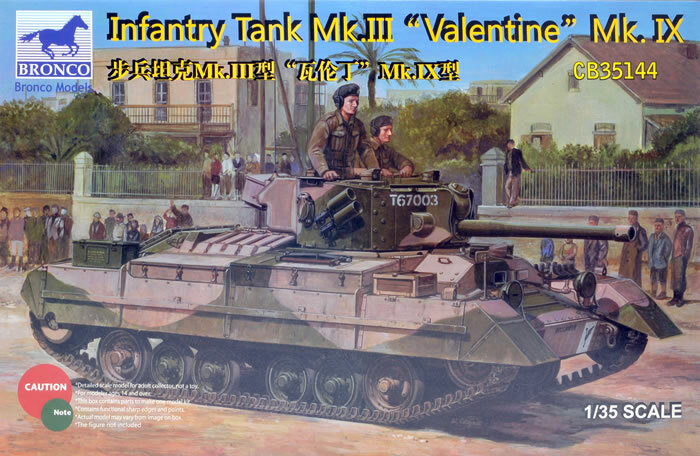 The Valentine was the most produced British Tank of WWII and came about as a private venture cheaper alternative to the Matilda Infantry tank. The Vickers produced tank, whilst built on the flawed Infantry Tank concept, was a very reliable mount that went on to be produced in many marks in both the UK and Canada and was used by the Commonwealth forces as well as being supplied to the USSR. It was also the pilot vehicle that proved the DD Swimming tank concept. The Mk IX was the first of the upgunned variants carrying the excellent 6 pdr Mk IV or V in a new two-man turret. Interestingly the turret was not fitted with a coaxial machine gun, which proved to be a handicap in service. This variant entered service with the 8th Army in the summer of 1942 and was well liked and popular with its crews having good reliability, armament and armour for the day. 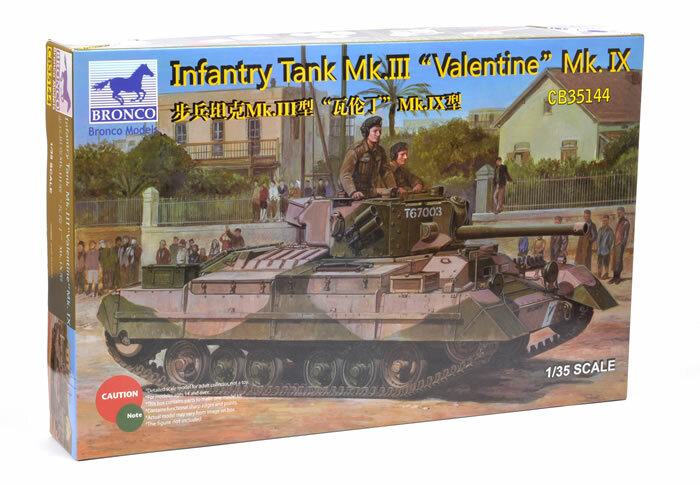 Bronco surprised a lot of people when they announced a kit of the Valentine Mk IX after tooling a family of Valentines for Miniart. 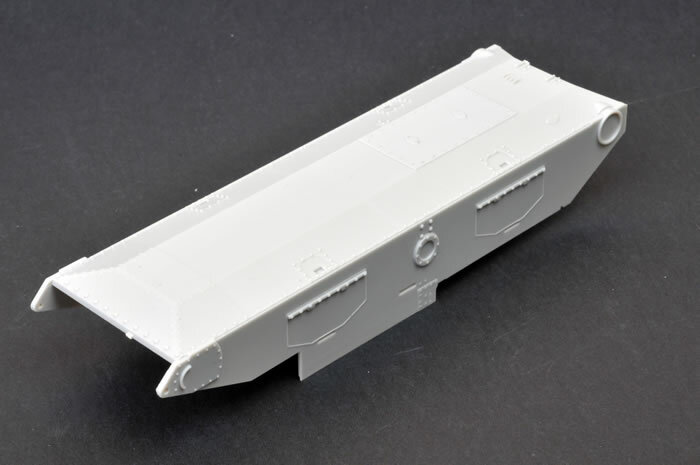 It was speculated that these would form the base for this kit but like other reviewers I was pleased to see that Bronco has retooled almost the entire kit and included their excellent individual track links. 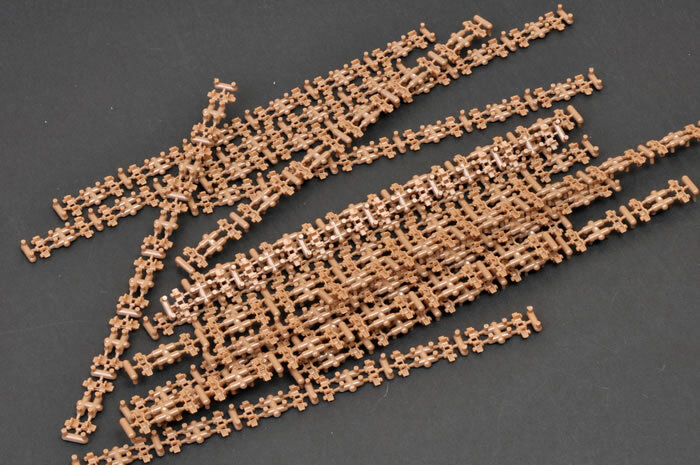 The kit is extensive and the vehicle is made up from 512 parts plus 216 for the track links and a large photo-etched fret. 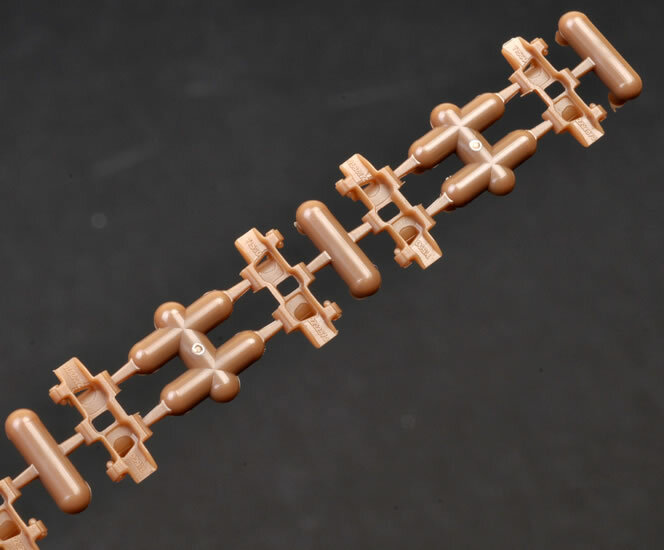 It is moulded in Bronco’s familiar light grey styrene with the track links being in a darker brown. The detail and moulding is fine and absolutely state of the art. 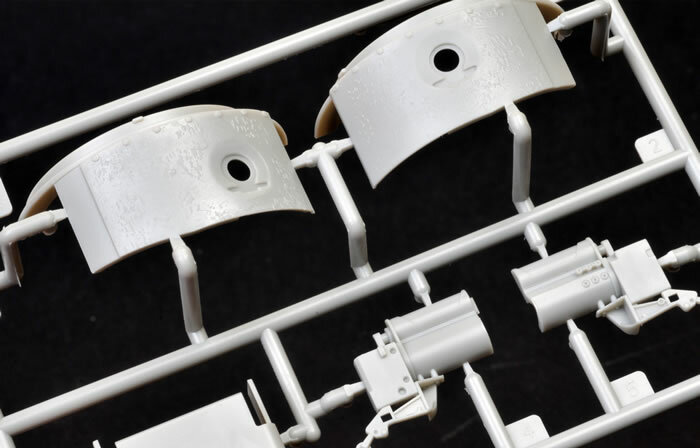 The kit features extensive interior detailing including a fully equipped engine bay with the option of displaying the radiators in their raised position for engine access. 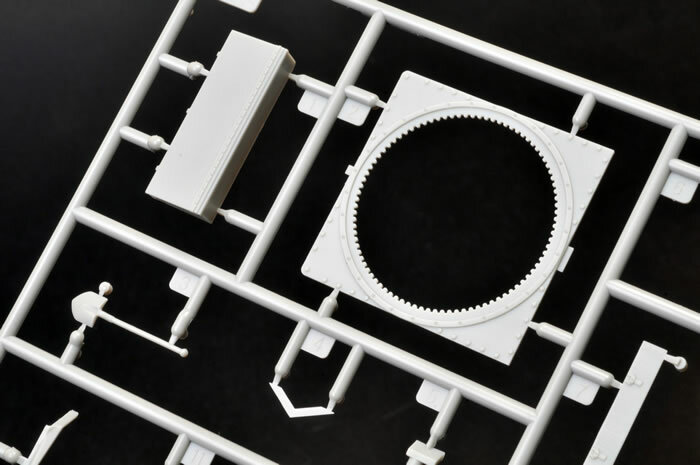 This will be particularly useful for the diorama builder wanting something different. Additionally the driver’s compartment is also detailed and a turret interior is provided with a detailed radio and gun mount. The gun supplied is a Mk V 6 pdr with options of a counterweighted barrel or one threaded for the counterweight. 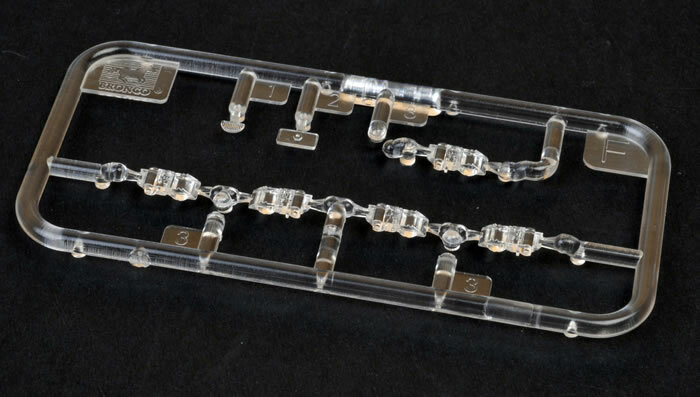 Clear styrene periscope assemblies are provided for all periscope positions and are multi part assembly that capture this complex device well. Also included are side skirts and a pair of 25 pdr Ammunition boxes of different type.s These were frequently used on British AFVs as storage bins although no further external stowage is supplied. 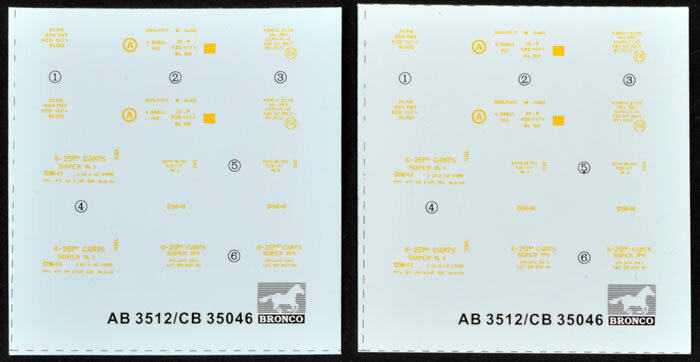 Four marking options are supplied. Polish 2 Armoured Brigade Gaza Palestine also illustrated in the Armor Photo History title. 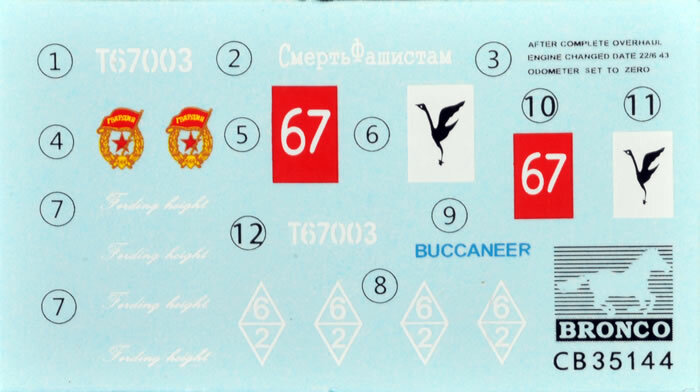 This has limited markings (an Engine overhaul stencil) and has a turret in what is probably Lt Mud with Blue black and a hull in Lt Stone with Blue Black disruptor. 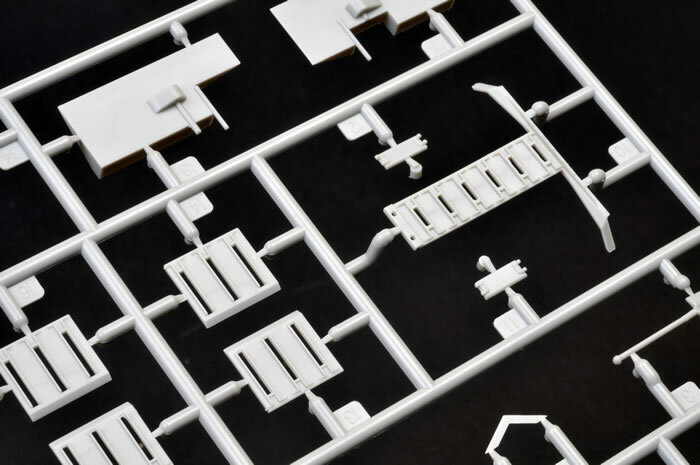 This kit is big step up from the excellent MiniArt kits, addressing all the minor problems. I could find little out of place with this kit from the references at hand. It has the usual high level of detail one expects from Bronco and will build into a stunning example of a Valentine IX. 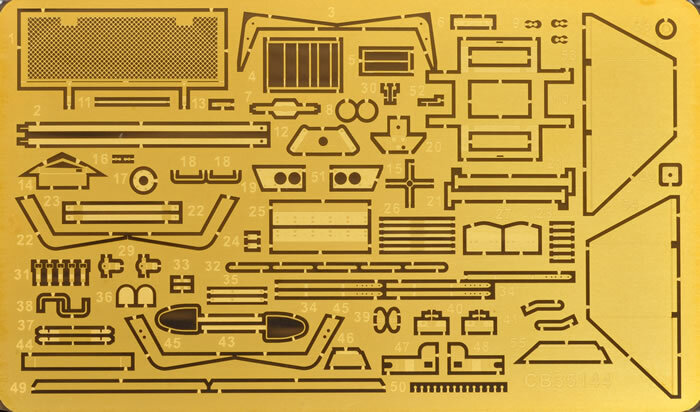 The amount of fine photo-etch and complex assemblies are not beyond the skills of most modellers but this is not a kit for the beginner or those inexperienced with PE. Unused parts indicate later marks are on their way.